The cross is nearly two-and-a half metres high and weighs 150 kg. It is made from six sheets of 10 mm thick float glass, edge cut and decorated laminated glass. This creates three crosses bolted together to give a three dimensional form. 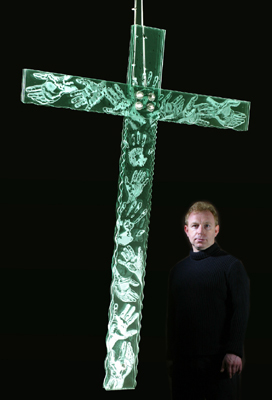 On the first layer are silver ‘tears’, and on the second and third layers are hands, sand blasted and engraved, some based on the hands of members of the church congregation.